Sakai Community DocumentationSakai 19 User Guide (English) Course and Project SitesWhat does Unpublished Site mean? By default, most sites in Sakai are Unpublished when they are first created. This gives instructors or course designers a chance to go in and edit the content of the site before it is available to students and other users. Some institutions publish all current courses automatically at the beginning of the academic term. Institutions may also unpublish courses from prior or future terms. 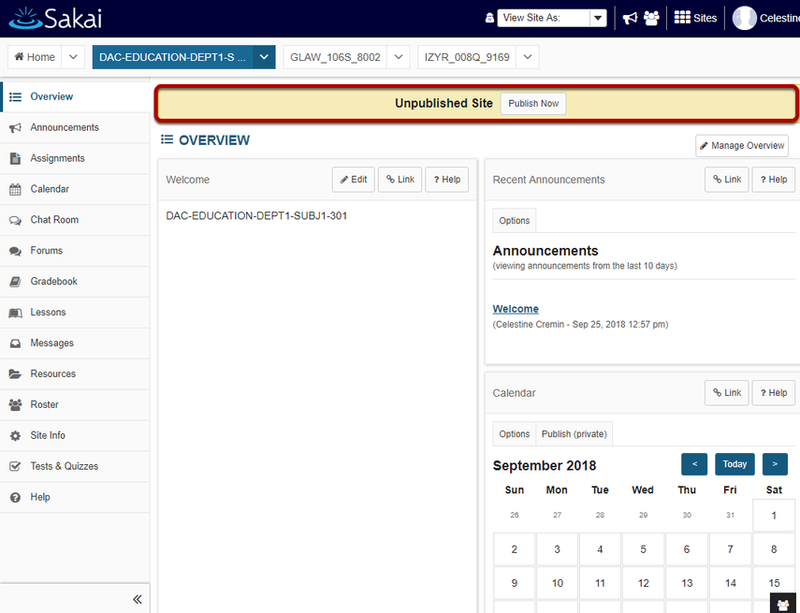 If you see the Unpublished Site indicator at the top of your site, that means your site is unpublished and is unavailable to students, teaching assistants, or other user roles which do not have editing permission. Instructors always have access to both published and unpublished courses in which they are enrolled. Note: You may also publish/unpublish your site from the Manage Access area in Site Info. Prev: How do I reset a tool?